PYRADIA TREW SERIES is our most versatile and compact series of automatic turret winders capable of handling multiple types of webs such as films, foils, paper and nonwovens. The center driven turret winder is equipped with AC Vector drives mounted at each mandrel position. The drives are coupled through a pneumatically counterbalanced dancer roll, for tension control. System operation is fully automatic and PLC initiated for continuous operation. Automatic system control is included for turret rotation, flying knife cut & transfer sequence and general system operation. The open frame turret winder (pictures 1-3) can handle 55” (4500 lbs) rolls up to 1200 FPM. It is equipped with a fully automatic flying splice mechanism, pneumo-hydraulic guiding system and dancer tension control system. Clockwise and counterclockwise operation | Accurate tension & density control over the full roll diameter | Compact footprint | Innovative index drive system | Carriage supported by linear bearings for a smooth splicing & transfer | Ability to operate in minimum gap or pressure controlled mode of operation. 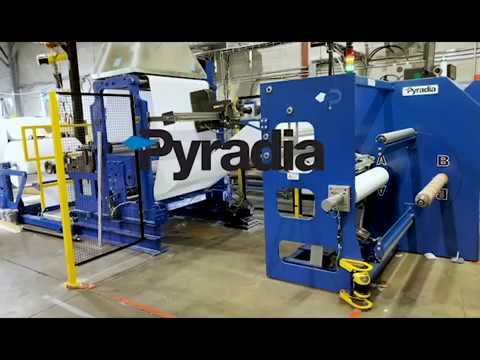 * Pyradia is a manufacturer of tailored engineered web converting equipment. If the characteristics of your projects fall outside the above standard specifications, our engineering team has the expertise to re-engineered existing and standard designs of turret winders and provide an affordable custom-made solution answering your needs.